These North Union High School seniors signed letters of intent to continue their athletic careers on the collegiate level. They are from left, front row, Dylan Thompson, Josie Duncan, Kamryn Rhodes and Hunter Zimmerman; second row, Nick Reeder, Ethan Hoffer, Anthony Padovano and Colton Clark. Wednesday was a day for high school athletes to set their futures in play at the next level. 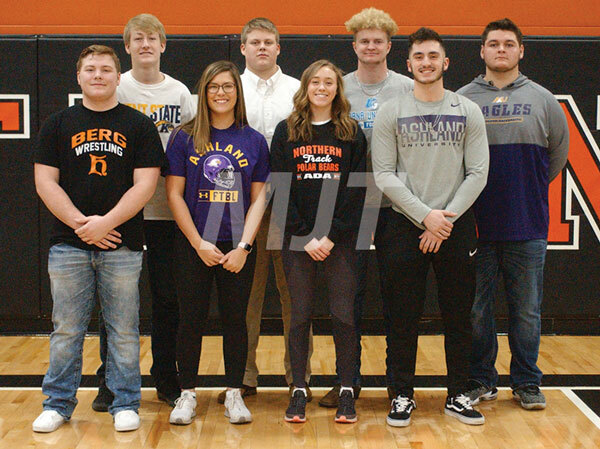 It was National Signing Day and seven North Union student-athletes took part in the day. NU athletic director Nick Hajjar said in his time at the school this is the most athletes he has seen signing out of a single class. -Kamryn Rhodes will continue her track and cross country career at Ohio Northern University. She earned all-conference and district honors for her running career as a Wildcat. -Josie Duncan signed early with Ashland University to continue her softball career. She has earned all-district honors in both softball and volleyball as a Wildcat.